Well the time has come for another Kustom Lane show, I just finished the poster today... 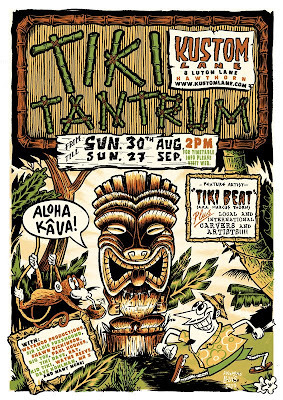 The show will be on the 30th of August and will run till the 27th of September... the show will inclued Tiki Beat, Watango Productions, Big Toe, Shawn Dickinson, Paul Huges, Tiki Dave, RAT, Kid Tiki, Wayne Reeve, Dave Kohlman, Mr Z and more!!! down the bottom here is another peice for Laura Embruglia...it's meant to look like a movie poster.... it's was good fun doing! !